We know you’re super busy. So we made this complete leadership guide to give you a hand. We’re so happy you popped in to read this guide. Honestly, there’s no better time than now to level up your leadership skills. What with the future of work in full swing, the differentiating factor for all organizations is the quality of their leadership. So, what makes a leader great? Empowering people to give and be their very best. It’s essential to the success of your team and company that you build up your leadership skill set, but who has the time, right? You’re a busy manager. Your schedule is probably jam packed with meetings. Maybe you’re dealing with conflict on your team? Trying to keep your boss happy? Everyone aligned on the business goals? It’s a lot, and adding something else to the list seems impossible, but we’re here to guide you the whole way through. The fact that you’re here reading this guide means you care, so you’re already on the right track! First, understand your own leadership. Whether you’re a seasoned leader or a manager-in-the-making, taking a step back to get a comprehensive view of your leadership strengths and weakness is key to moving in the right direction. You may think you know what you need to work on, or where your strong suits are at, but what does your team think? Our team of leadership & engagement experts built a simple Leadership Assessment to help you collect these golden insights. It’s important to reflect on your own leadership, while also getting 360° feedback from those you work with, since we all have blind spots. Self-Evaluation: Assess yourself based on our 12 metrics of leadership. External Evaluation: Send the same assessment to 3+ people you work with to see how they perceive your leadership. Insights: In a clear report, you’ll see where the discrepancies are and what elements of your leadership are in the green, yellow and red. It’s a sort of X-marks-the-spot on what to work on first. One of the most amazing things about working on your leadership skills is that you’ll get to see yourself transform as a person overall. Leadership is founded in relationships and developing people (including yourself). It’s a human based role, so this journey toward betterment as a leader is at once one of personal discovery, understanding and becoming the best version of yourself. How cool! And what’s more, once you start to grow and develop your skills, your leadership will become contagious (in a good way). You’ll inadvertently awaken the inner leader in those around you. This ripple effect is pure magic to see in action! We believe that leadership is for everyone, no title necessary. So long as you have the will to lead and an inclination to help others reach their potential, anyone can be a leader. And it all starts with you! Leaders aren’t born overnight, but all great journeys begin with just one step. If you apply the simple tips from this guide every day, and commit to practice and reflection, you’ll be making a difference in no time. Our three Leader Laws will be your go-to for decision making. They should guide the way you handle situations, make calls and interact with people every day. Memorize them, live them, breathe them… even recite them in the mirror every morning (we do). Essentially, these are the uncompromising principles of great leadership that must always stay in check. Whatever you preach, you must also practice. In order for people to buy into your vision, you need to walk the talk. If you want employees to trust you, you have to trust them. If you want your team to admit to mistakes, you’ve got to do the same. If you preach work-life balance, show them that you follow your own advice. Be the change you want to see, and whenever you’re unsure about what you’re asking from your employees, ask yourself, do I do this? The role of the leader is to guide people, not command them. The days of top down structures are long gone, and it’s time for all leaders to assume their proper place. Nelson Mandela famously equates a great leader with a shepherd who “stays behind the flock, letting the most nimble go out ahead, whereupon the others follow, not realizing that all along they are being directed from behind.” A leader’s job is to support and guide from the bottom — to help lift others, not themself, up into the spotlight. It is an uncompromising law of leadership that all leaders must see their employees as people, not just workers or worse, a dollar sign. The future of work demands that we put people at the center of every organization by encouraging them to bring their whole selves to work. The workforce is in need of inclusive leaders who lead from the heart and consistently prioritize people over profit. Companies are nothing without the people who form them, and the best leaders ensure that the practices of the business and the team reflect this, always. Always. here are the top 10 skills and qualities of great leaders. We’re sure you’ve bookmarked and pocketed 1000 articles listing the most important leadership qualities and skills for you to develop. But who has the time to read them all? While information is good, too much information can be counterproductive. Not to worry — we took care of plucking out the most important skills and qualities for you to focus on. We’ll also share some common workplace scenarios and how to tackle them like a true leader! You got this (strong arm emoji in your honour). Constant communication is a foundational skill in any relationship, but on teams, the absence of communication is a sure sign of trouble. As a leader, you want to create a communication-friendly space where it’s safe to express oneself and share ideas without fear or embarrassment (more on that here). Leaders must facilitate open communication by promoting the expression of differing thoughts and perspectives. The best way to do this is to model the behaviour yourself! You know the drill, lead by example to encourage others to do the same! You’re meeting one-on-one with someone from your team who has recently missed a deadline, and this is when you find out that it’s because they were overloaded and couldn’t keep up. Some employees have a hard time saying “no” to projects, and then fail to communicate that they’ve taken on too much because they don’t want to let their team down. Let your employee know that it’s better to flag these issues as they arise by communicating openly with the team, before they impact the bottom line. The trope of the strong and infallible leader is outdated, and ascribing to it can be detrimental to your success, which goes hand-in-hand with the success of your team. If you’re not able to be vulnerable and open with your team, they won’t be vulnerable with you, either. But before anyone can be vulnerable, there has to be mutual trust. The best way to earn trust is to offer it out for free, so trust in your team members by default to build solid foundations in all of your relationships. Admitting to your own imperfections will earn you the trust and respect of those who report to you and those who you report to. You’ve been put on a few additional projects recently, and you’re having trouble getting it all done and properly managing your team. Your first move should be to speak with your own manager, and work with them to find solutions to help you prioritize your team. More importantly, though, you should speak with your team. Let them know that you’re being stretched a bit thin, and admit that it’s hard on you. Then, remind them that they are your top priority and you’re always there for them, so you’re working on finding a solution. A huge part of leadership is inspiring and motivating your team toward a shared vision and common goals. People are motivated when they feel their hard work serves a larger purpose, so take the time to demonstrate how their tasks are connected to the bigger picture. When everyone on the team has the same mission in mind, collaboration and teamwork will be their strongest. And of course, make sure everyone is receiving frequent and meaningful recognition for their efforts. The team has been in a crunch leading up to a big event, and everyone’s been putting in extra effort. You can tell that morale is dwindling. Don’t wait until the celebration after the big event to recognize everyone’s dedication. Call a team meeting and take the time to tell them all that you see how hard they’re working and how proud you are. Remind them of how their work contributes to larger company goals. Hearing it while they’re in the thick of it will give them a boost! In a position founded in relationships, you must develop soft skills and emotional intelligence to navigate the human elements of your role (lead with humanity!). It starts with getting to know yourself better, and then you can become more conscious of how your emotions influence your behaviour — and how your behaviour influences other people’s emotions. This includes the ability to identify what shapes your opinions, and avoid projecting them onto other people (or groups of people). It can be hard to understand the way that others think and feel, but working on this will help you to best address the needs of your team members in an effective way. Your employee made a mistake — a big one — that will have a direct negative impact on a client, colleague, or business objective. It’s natural that this might cause you to panic, but what’s important is how you manage that response. The last thing you want to do is get mad, lash out, or punish your employee. Your focus has to be on helping them find a solution. Meet with your employee and tell them that you’ll fix this together, then talk them through it. Ask them about what they did, what impact it had, and what needs to happen to rectify the situation. The best leaders guide their employees through problem solving rather than telling them what to do, even in the most critical moments. Putting people first is essential to modern leadership! The better you know your team members on a personal level, the better you’ll be able to guide them professionally — not to mention tap into their unique ideas and perspectives. Take it a step further by encouraging that same relationship building among team members for stronger creative collaboration and problem solving. Remember that the happiness of your employees is inextricably linked to the happiness of your customers. One of your employees has a sudden personal crisis, and needs to take a leave of absence. First, reassure your employee that the team will have their back while they’re away, and ask them what you can do to support them. Then, meet with your team to fill them in on what they need to know and how they can support their team member, too. Come up with a plan and reassure your team that together you’ll tie up any loose ends for the employee on leave, without anyone shouldering too much. The strongest leaders are humble; they’re not in it for the title or the status. Strong leadership is about empowering others, not being in a position of power. You need to see your team members as equals, and recognize that you have something to learn from each and every one of them. This means having enough self-assurance to focus more on the success of your team than any personal gain (lead from the bottom!). The magical part is that when you take on such a selfless role, you end up discovering a lot about yourself in the process. You have a meeting coming up with the other leadership to go over the OKRs of the past quarter. Your team has been killing it, demonstrating strong collaboration and teamwork, coming up with creative new approaches and ideas, and hitting all their targets. Of course you’ve been doing a great job managing the team, but rather than focus on how your effective management led them to success, talk about what they did. This is a great opportunity to let your team’s efforts shine, and it will be obvious that you supported them through it all. As a leader, you’re only as strong as your team, so you want to build them up as best you can. Part of this is helping them develop their technical skills, but you also want to help them develop their soft skills and their confidence. Coaching your employees directly is a great way to connect with them if you have the time and expertise, but if not, it’s important to set them up with the right person for the task. You should also always be striving to develop your own skills and become a better leader; this is a great way to be a role model to your team (lead by example!). You’re managing a team of sales representatives, which was the role you were in before being promoted to management. You coach each of your employees individually on a technical level, but your team is growing and you’re having a hard time following up on everyone’s progress. Instead of outsourcing another coach, why not start mentoring one of your more experienced employees to become a coach themself? They could become a peer coach for newer or less experienced team members, allowing you to be more effective in your coaching with the rest of the team, giving you more time to focus on your own development. Encouraging curiosity and learning won’t just keep the people on your team engaged, it’ll also lead to the innovative ideas that will set your company apart. You want to create a space in which people feel safe to think outside the box, test new approaches, and yes, even fail. Your role in this as a leader is to encourage calculated risk taking and help everyone find the lessons to be learned, regardless of whether you win or lose. As a leader, create a learning-friendly environment by speaking in terms of hypotheses, tests, and iterations rather than certainties, outcomes, and final products. Your team worked really hard on a project, but it didn’t turn out as planned. You might be disappointed, and you may be able to spot where it went wrong, but resist the urge to give your perspective right away! This is a great opportunity to help the team learn from their mistakes. Ask them where they think it went wrong. Have them reflect and talk through what worked, what didn’t, and what they can try next time. Being an effective leader doesn’t mean having all the answers, it’s about helping your team find them themselves. It’s not easy to admit that you messed up, or take the blame when things go wrong, but as a leader it’s essential to upholding your integrity. When you make a decision, you have to own the outcome — good or bad. If you fall short on something, admit that you screwed up and apologize sincerely. People value honesty and no one likes the feeling of being the last to know, so make sure you’re updating your team on anything that will affect their work as soon as it comes up. You can’t expect your employees to be accountable and transparent with you if you aren’t with them. You made a game time executive decision, and it’s impacting your team more than you expected. You can sense some frustration, and possibly even some resentment, but it’s too late to go back now. Be upfront with your team and take full responsibility for the effects of your decision. Apologize, and acknowledge that even though the impact was unintended, it’s on you nonetheless. Let your team know how you plan to improve the situation, or how you’ll avoid a similar one in the future. In a workforce that’s evolving at an exponential pace, great leaders need to be agile, and build agile teams who can navigate the uneven terrain. This means reassessing and redefining goals and tactics regularly. A process that your team perfected six or even three months ago may no longer work, and your team will have to adapt on the fly. You want to inspire them to embrace change with open arms — that way, you and your team will be up for the challenge when adversity strikes. The C-Suite executives of your organization present a strategy for the coming year that significantly redefines the company’s bottom line. There’s a palpable uncertainty throughout your team, and anxiety about how roles and responsibilities will change in their day-to-day. As a leader, it’s important that you project a positive attitude toward this type of change to reassure your team that you will all adapt together. Let them know that you’re there for them, then clearly outline and communicate how this will alter your team’s direction, and make sure everyone’s on the same page. Not all leaders are managers, but all managers must be leaders. You probably already know this, but the role of a manager is complex. It’s a two-in-one position that requires both management and leadership skill sets. The trick is finding the sweet spot between the two, and this balance, like most things, comes with practice. At its base, Management is about the “how” you do things (the technical elements, the planning, the processes and the organization), whereas Leadership is about the “why” (engaging people by connecting everything to a larger mission, and thinking beyond the now to what could be). Below, we map out some key differences between management and leadership — and where they overlap — to clarify the duality of your role (FYI, this list is not exhaustive). As you can see, both areas of focus are equally important! No manager — no human being — is perfect, so it’s inevitable that you’ll have to work on building up some of your skills on both sides of the coin. Our hope is that these lists will help you figure out where the best place to start is for you. Great job finishing this guide! It’s a huge leap in the right direction and it will hopefully serve as a go-to for you along the way (we’re always here for you). Remember, becoming a leader is a continuous process. The more experiences you have and challenges you face, the more you’ll grow. In fact, being open to learning is paramount to your success. Remember that when in doubt, consult the Leader Laws in this guide. 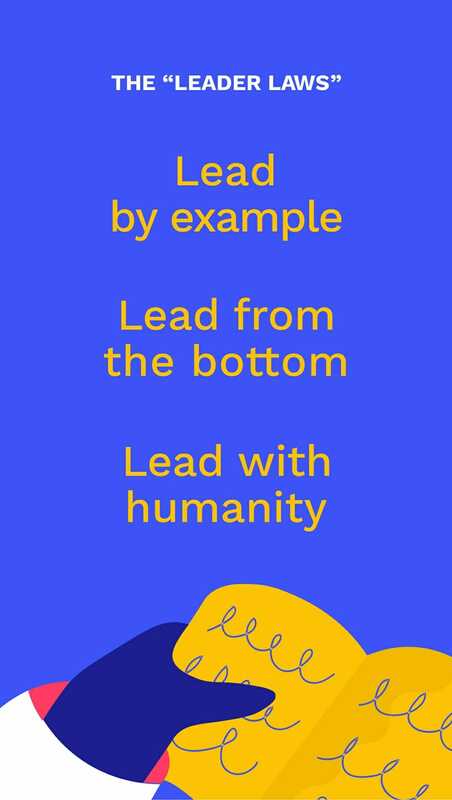 A true leader is one that leads by example, leads from the bottom, and leads with humanity. We’ve put together some of our favourite go-to leadership resources so you can keep on keeping on. The complete guide for new managers. Boost your EQ with this email course. Make the most of your one-on-ones. Alright, you’re ready… now go get your leader on! Tell us how you plan to improve your leadership in the comments below.